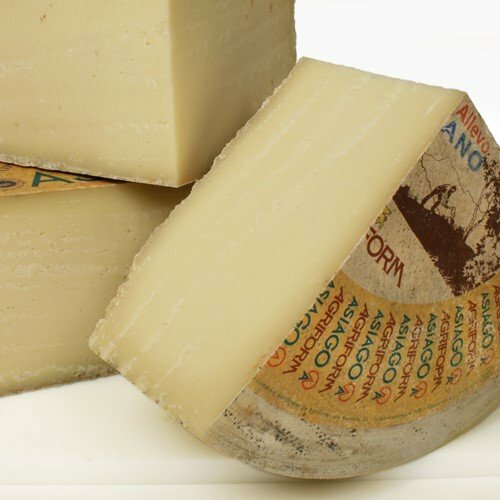 Northwest of Venice, tucked beneath the Dolomite Mountains, artisan cheesemakers produce Asiago using traditional methods: no computer-operated machinery or temperature-controlled rooms, just cows and grass, men and women, and an abundance of Asiago. A light beige cheese peppered with small holes, Asiago d'Allevo has a slightly fruity appeal and an engaging aroma. Aged for up to five months, it is firm enough to shave or shred. It's often used for cooking and in salads, but also makes a tasty cracker cheese. Photo depicts whole 20 lb. form of cheese.